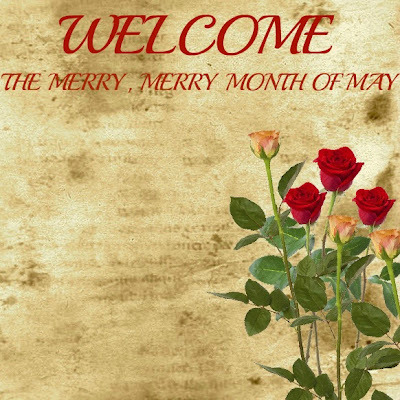 Welcome to a new month, the merry month of May. With spring in full bloom, summer can't be far behind. Usually May brings sunshine and blue skies and May is the perfect time to enjoy glorious spring! In the month of May many celebrations abound. Festivals, flower and fruit shows and our love affair with outdoor sports and family gatherings to name a few. 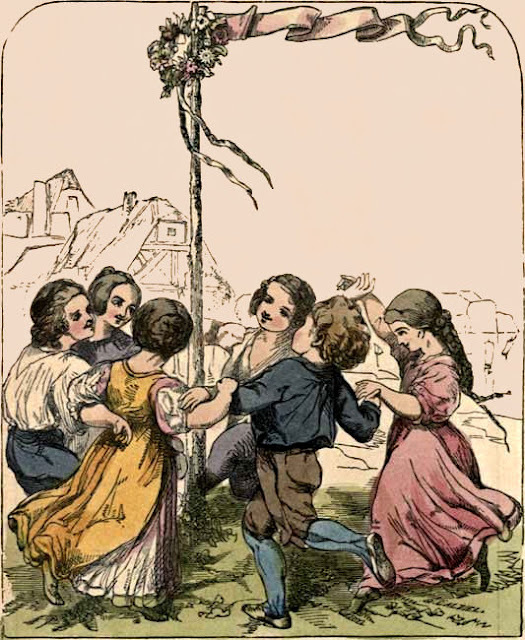 One of my favorite customs, the maypole dance is celebrated by school children throughout western Europe and young children in school in America. A form of folk dance this custom is traced as far back as the middle ages in western Europe. Ribbons are attached at the top of a pole under an umbrella of flowers. When music begins to play children dance in a circle around the pole weaving the ribbons over and under until the pole is covered with ribbon. Then the dance is reversed to unravel the ribbons. 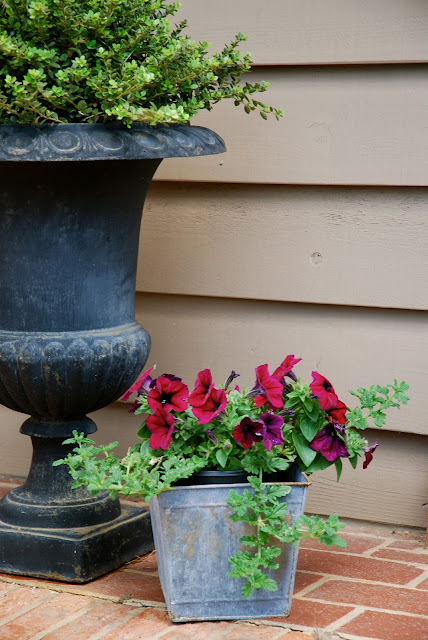 Spring and May is when I love to add a new welcome look to my home. I add a wreath to the front door to welcome guests and a touch of color with flowers on the porch. My elementary school celebrated "May Day", the first day of May with a celebration in the park with a picnic lunch and maypole dance. It is a memory I cherish. Tell me please, did you celebrate "May Day"as a child and do your children? I would love to hear. Happy Merry Month of May to you, Emily! This will be a special may for me as my daughter's wedding will take place in a few weeks. May was always celebrated as Mary's special month in my elementary school and we girls would dress in our Communion veils and have a parade around the school block as we carried flowers and and sang hymns. Yes I did celebrate May 1 by dancing around the flagpole with colorful ribbons! You're the first one to mention it in years. What fun we children had that day, making a beautiful pole of pastel colors! I love your blues. Happy May Day (a day early) Emily!! What fun and festive pictures these are. I have always wanted to join in on a celebration like this, but I have not yet found one at the Jersey Shore (lol). 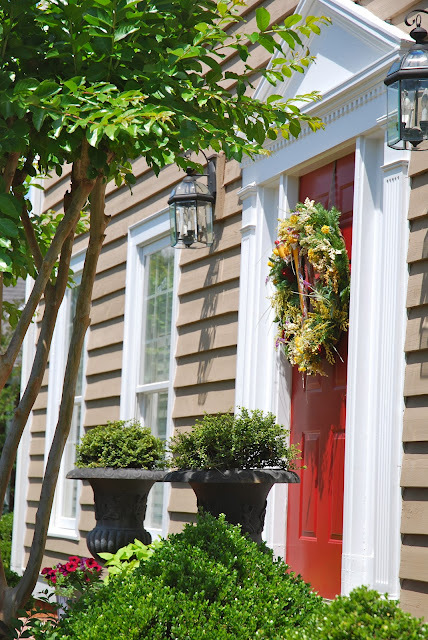 Love the wreath...it is perfect on the red door. Have a wonderful week. Yes I love May Day.. that is my daughter's birthday and this year she is 6! we made our own maypole and cannot wait to see all the kids dancing around!! I am SO ready for May...one of the best months for me! Love your post! Lots of pretty flowers and decor! It's nice when there's lots of sunshine for photo taking! Enjoy your week! I love how your have decorated your front door. Just beautiful. Yes we all celebrated May Day! 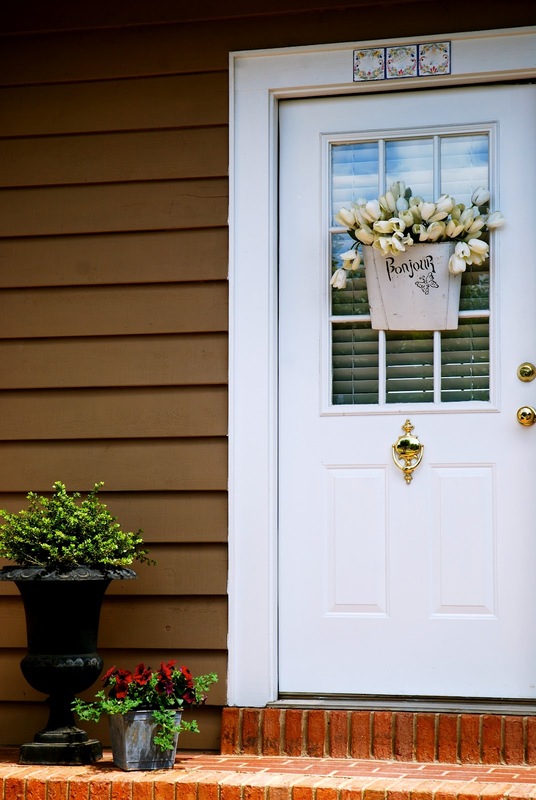 In recent years it is custom to put a bouquet of flowers on a neighbors front door and ring the bell and ran away so it will be a secret surprise! Hard to believe it's almost May. Time goes by so quickly. Lovely photos. Thanks so much for sharing those facts about May day and the pictures of May pole dancers (not to be confused with regular pole dancers). I loved seeing the pictures of your lovely wreath, your pretty flowers, and your garden. I saw your post over at "Thrifty Treasures Party". When we lived in Germany the children went around early in the morning and attached little 'May presents' to one another's doors. They were usually little paper cones filled with goodies - such a sweet custom. Lovely photos and oh, so Merry! Just beautiful! The wreath is gorgeous! I remember dancing around the Maypole in elementary school. I didn't know many schools still did that. Thank you for these pictures! Thank you for sharing the bit of history! Love your beautiful wreath. So many beautiful areas to comment on, Emily! Love your French wreath. So many pretty textures and layers. I am always lusting after your back yard and the trailing roses you have there. Such a magical place. Thanks so much for showing off your lovely home and your front door decor today. Beautiful homage to the Merry Merry Month of May, Emily. I love the blue and white in your foyer. Everything is just gorgeous. Emily, I am loving this post! Happy May Day to you!!! :D Your home and gardens are so pretty and welcoming. I love the way you have decorated for spring. 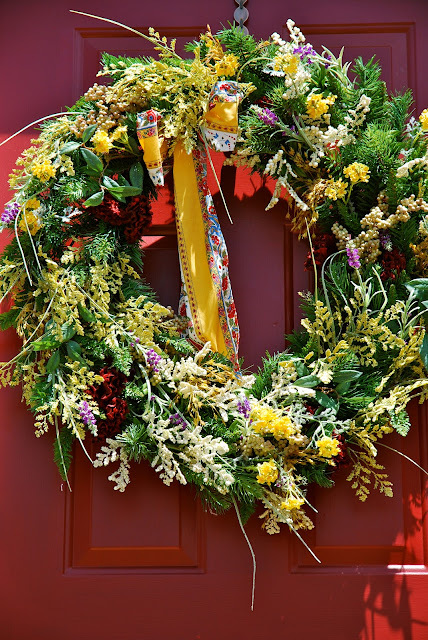 Your wreath is *gorgeous* I agree with Alison...your home is magical! Beautiful photos! Love your front door and wreath. Yes, I have fond memories of May Day as a child. We made paper May Baskets, decorated, and we were supposed to hang them on the front door, ring the door bell and hide (as a surprise to our mothers). That is still so clear in my mind. And I do recall dancing around a Maypole way back. Everything looks beautiful, inside and out!! LOVE your wreath and beautiful entry hall! My goodness, you celebrate May Day in a big way! 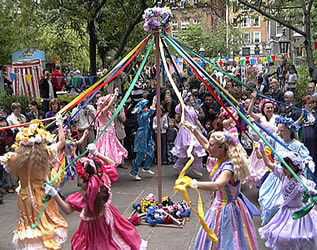 Emily, We never celebrated it but we did see a May Day celebration in Germany with the children dancing around the pole. Everything is so pretty and I love the wreath. Hi Emily and happy May Day! 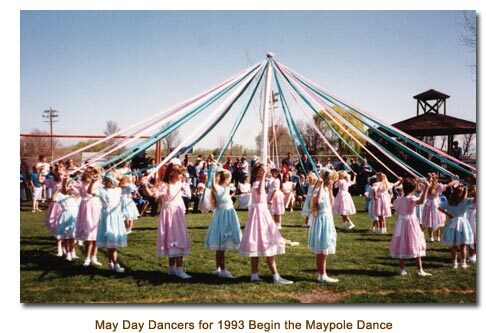 I have never been anywhere that May Day was celebrated but when my daughter and her husband lived in England, their little town did and even had the May pole in the center of town. 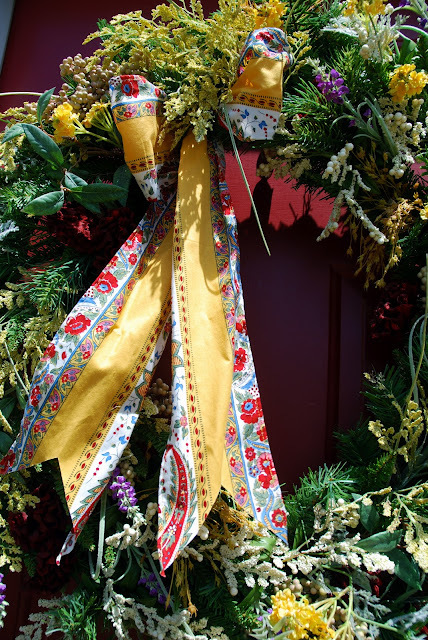 Your red door and wreath is so pretty! Your gardens and plants are lovely. Thank you so much for your kind comments about my little felt ornies. I love that charger you found at an estate sale. Very nice photos this week. Oh my goodness, you brought back such great memories. 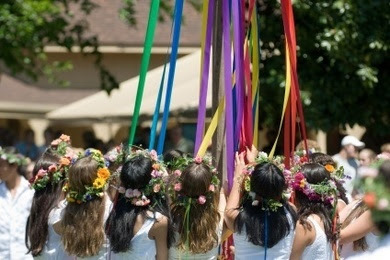 When I was in elementary school in the 1960s, we celebrated each May Day and yes we danced around the pole, weaving the ribbons as we danced. It was soooo much fun! Beautiful pictures. I love your wreath. Emily, May has definitely arrived at your beautiful home. I love your front entry, so lush and elegant. My Jasmine is blooming as well, Oh, the aroma. 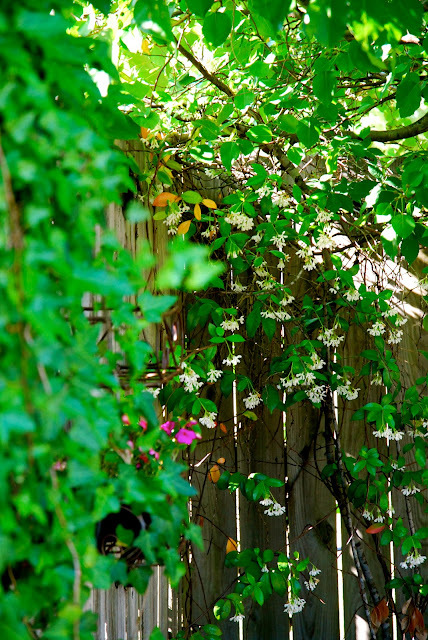 As we sit on the porch we can smell the sweet breeze of Jasmine from the rear of the house. 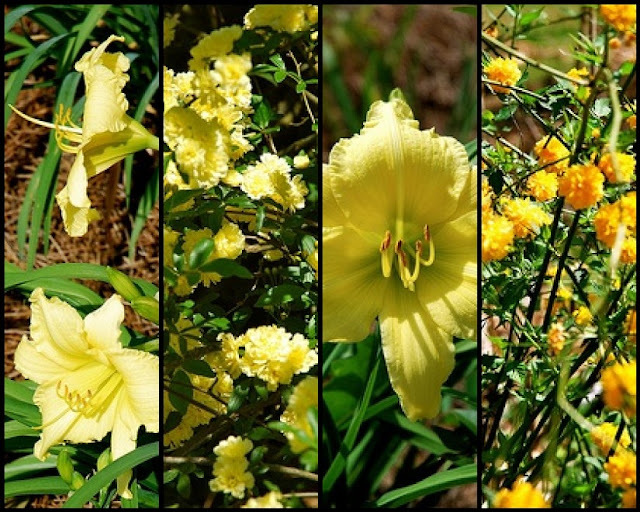 Your garden is looking great, love the day lily pic. Gorgeous! 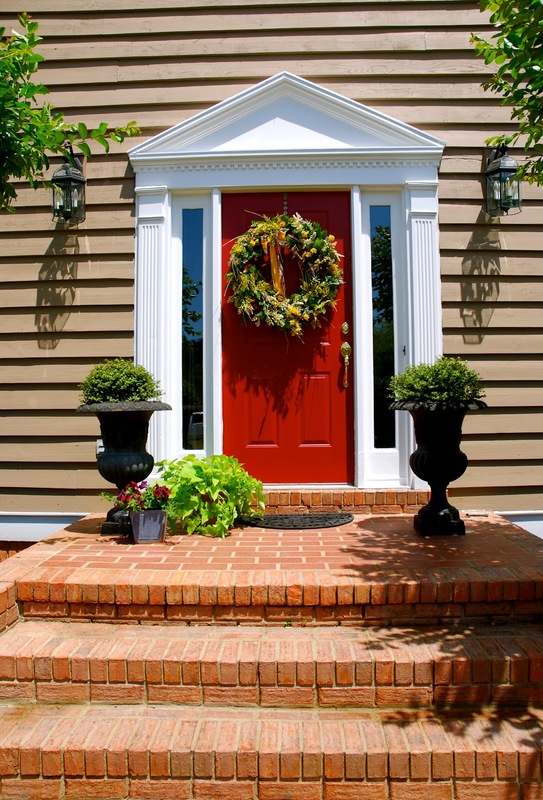 I love that wreath on your front door; it looks stunning especially with your urns. Love the back door, too, with its flower pocket. Yes I can remember in 5th grade having a May Day Celebration and having a May Pole. Fantastic memory. Your front door wreath is lovely--makes me feel like MAY. Every other entrance is gorgeous. Beautiful colors everywhere. Beautiful home and beautiful photos. 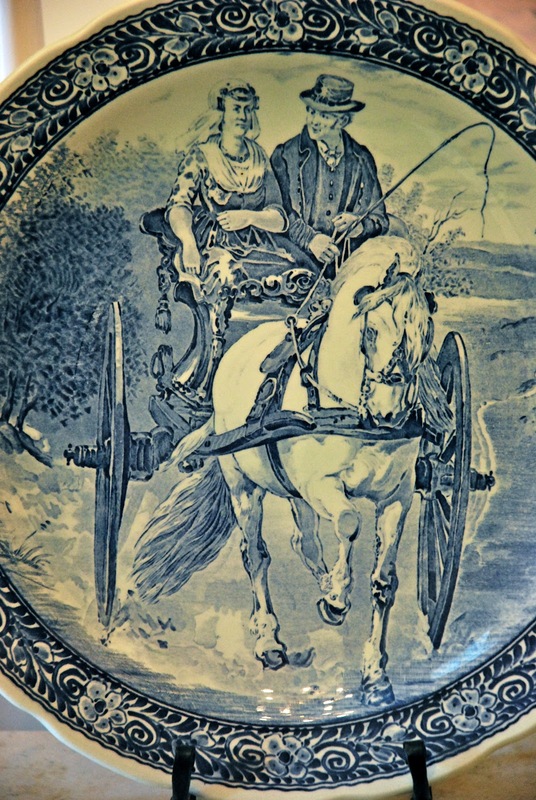 I recently saw some antique Quimper and fell in love, haven't started a collection yet since it is quite an expensive hobby. I have never been fond of some of the modern day Quimper but when I saw antique Quimper, OMG the bells and whistles went off in my head. Hopefully my soon to be newest collection. I am anxious to cruise through your blog and enjoy what you have shared. Love those Quimper welcoming tiles, what a clever idea and this is my first time participating in your blogging party. Hello Emily - your entrance is fantastic! A beautiful welcome to spring and to May! 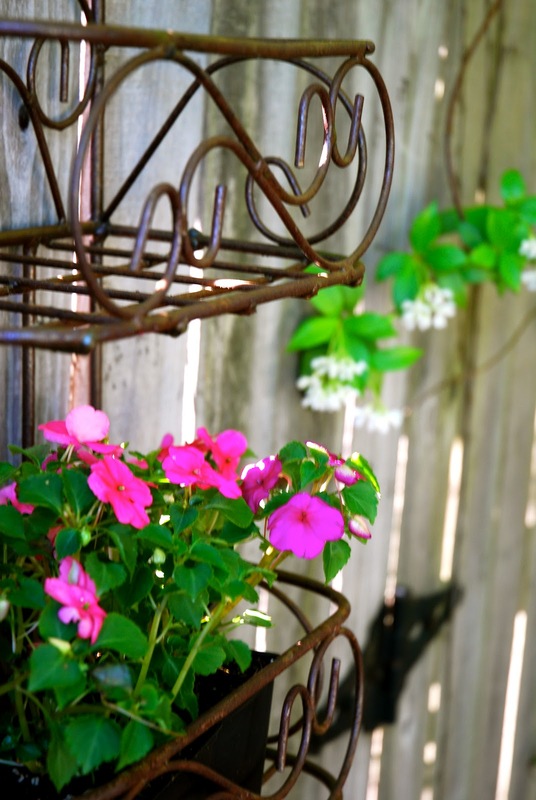 I love your hanging basket - I'd love to begin collecting Quimper - it is gorgeous! Emily your pictures are so fabulous. Clearly I have some gardening to do. I am so inspired. The phots of the may pole dancers aer wonderful. Thanks so much for sharing! You have inspired me. Your pictures/posts are comforting. Have a great week. Yes, we celebrated May Day the same way in elementary school! Happy May, Emily! I love the month of May and that's why we got married in May! 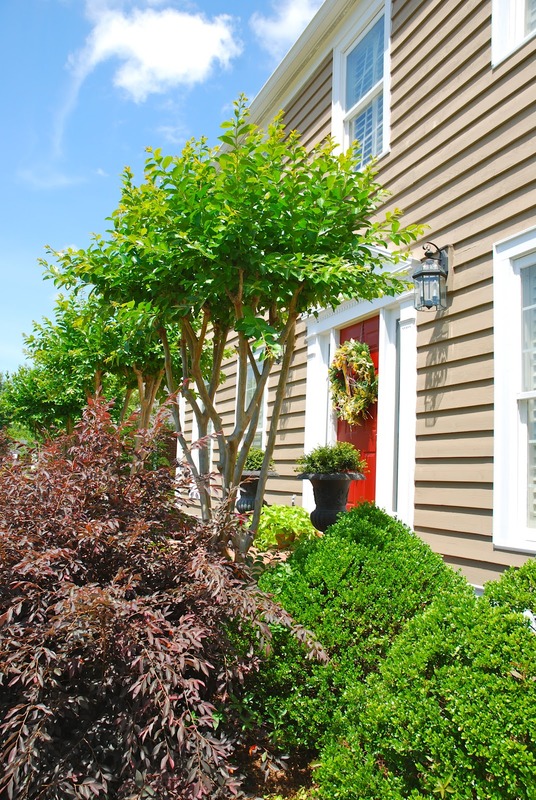 I love the ivy trailing over your fence and your red door is stunning! 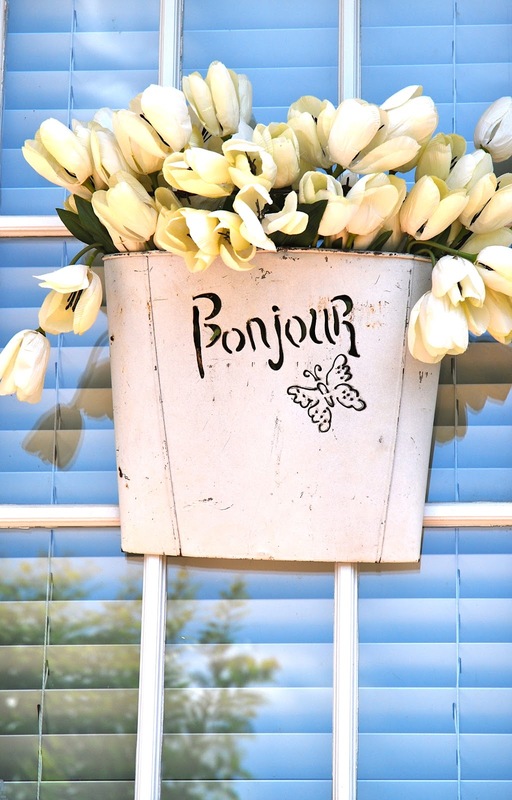 Thank you for sharing a wee peek at your home. It's lovely! Enjoy the weekend and Happy Pink Saturday! Oh, yes we did the Maypole ... & we made May baskets to leave on neighbors doors to greet them on May 1st. What fun to watch their delighted faces. Not only beautiful but so inviting ! 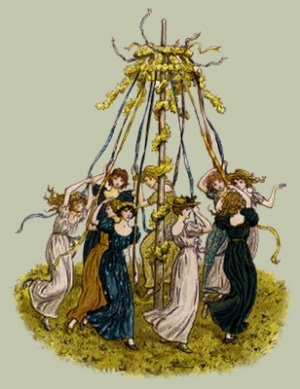 We lived in New England for a few years when I was a child and we did celebrate May Day, we made and gave May Day baskets and even had a Maypole. I would love if you link this Monday to the French party! My readers would love it! 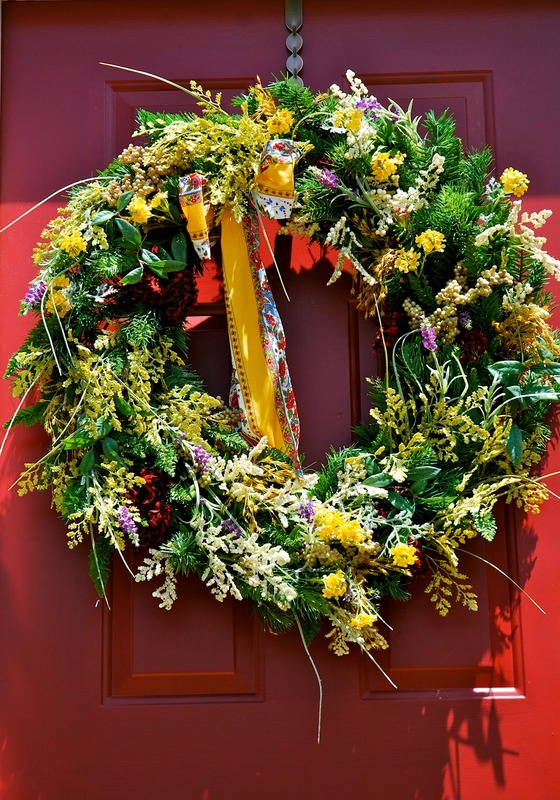 A stunning wreath on your front door! So much colour and shades of green in your garden, soon ours will come alive too. What a beautiful filled memory share today. When I was in High School, when the seniors did their walk, the sophomores and junior girls would wind the May pole while they walked. It was called May Fete. Was so beautiful next to Springs Park where the spring ran through. It was a lot of fun. Your share today pulled that memory from my mind. I love it. Thank you sweet friend. 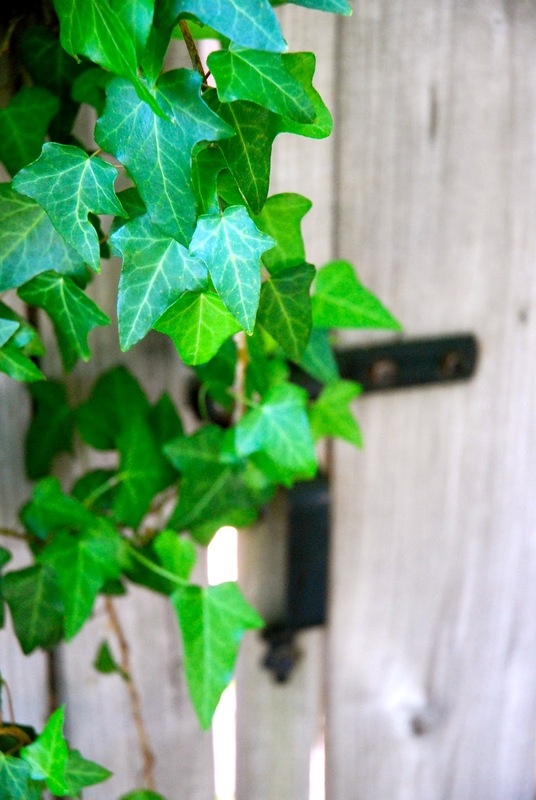 Loved your photos and your ivy is gorgeous and I love your door. How pretty it looks for the merry month of May. What a beautiful entrance! Also a beautiful post! Happy Pink Saturday! You brought back fond memories. We walked around a May pole when I was in grade school. Beautiful entrance and wreath. Thank you for sharing. Oh I love this! May Day! Pretty sweet pink touches. Thanks so much for linking, There is another one going on right now...I would love to see you there.